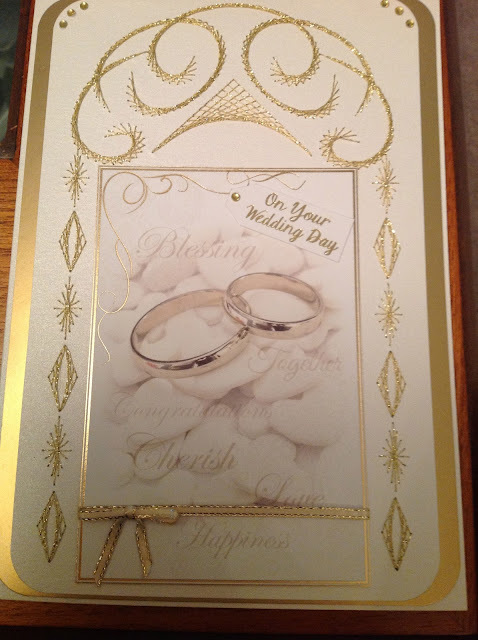 I was asked if i could make a wedding card, I did not know if it was a church wedding, a special venue or which religion. I decided to stitch this pattern, which I thought looked like an arch. I used gold metallic thread, once I had finished the stitching I had a look through some toppers I had. I can't remember if this topper is a Hunkydory or Kanban. I used this topper as it didn't matter where the wedding was or which religion. I thought the swirls in the topper matched the swirls in my stitched pattern.